Carlson Heating, Air & Hot Water can provide you with a free estimate for installation over $750. We will install the latest in high efficiency equipment with the highest quality of workmanship with pride. Bob Carlson and his installation crew are trained in the latest technology for HVAC equipment. Our installation crew will conduct the installation in a neat and clean manner with pride. Carlson Heating now has financing available through Energize CT. Apply online now at by clicking here. Now you can upgrade your existing water heater and boiler, furnace or heat pump to a single high-efficiency system engineered to deliver high performance and exceptional fuel efficiency and economy. System 2000 combines heat and hot water with a single high-efficiency appliance to maximize efficiency in all seasons, with the additional benefits of virtually unlimited hot water and whisper quiet operation. 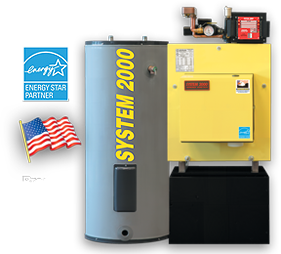 System 2000 is a multi-fuel system and runs with natural gas, propane, or oil heat, and can be converted between fuels with a simple burner change. The rest of the system stays the same. So start saving with oil or propane today, even if the gas pipeline hasn’t made your neighborhood yet. System 2000 has better technology for bigger savings than boilers with similar ratings, up to 38% over other new boilers. A heavy cast iron boiler takes a lot of energy just to heat the boiler itself. And when the burner shuts off, all that energy starts to slip away. Our low mass boiler heats fast, and our Hybrid Energy Recovery® (thermal purge) captures energy at the end of the burn that is wasted in other systems. 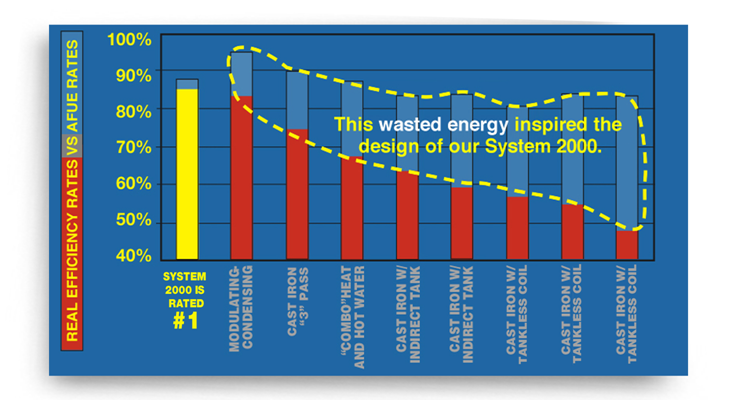 The combination of low mass and thermal purge is so effective that our non-condensing design delivered better annual efficiency than even the highest AFUE rated condensing boilers in the Department of Energy Lab study. If your home is a good match for a condensing boiler, be sure to take a look at our up to 96% AFUE Accel CS™. It’s the same great technology in a condensing package, and Accel CS is made right here in the USA! System 2000 produces super-efficient high output hot water. With Energy Kinetics’ heating systems, hot water is readily available through a high performance hot water storage tank. System 2000 replenishes hot water as needed, and anticipates when no additional hot water is required. At the end of a hot water call, the burner* automatically shuts down, the Hybrid Energy Recovery cycle recovers heat left in the boiler and delivers it to the hot water storage tank so no energy is left wasted in the boiler. The result: Better Comfort. Better Heating. Bigger Savings. Whisper quiet operation is extraordinary. The industry leading burner air box design filters out annoying sounds and background noises. In addition to being efficient, the spiral boiler design combined with System 2000’s heavy insulation is an extremely effective noise dampening system. Flue products travel over 10 feet in a System 2000 before exiting into the flue (and an amazing 18 feet on the larger EK3 models). These features are unique compared to other home heating systems, and common cast iron boilers’ flue passes are less than one (1) foot long. For natural gas, oilheat or propane, System 2000 leads the industry in noise control. The result: System 2000 is quieter than a microwave, and it’s the quietest oil boiler available. Check out more about the System 2000 and how it can save you money!